The office Christmas party is coming up and you want to have a good time, but you do not want to do something that you could regret. When the good times start to roll, it can be difficult to remember that you have to work with just about everyone at the office Christmas party and you will see them all year long. It can also be difficult to censor your language around your boss and his family. 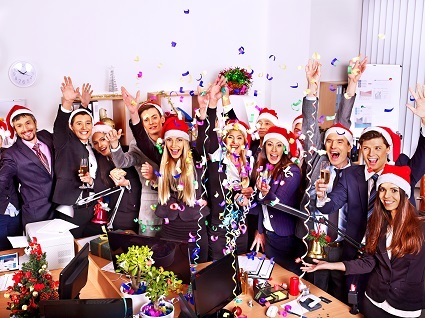 The best way to have fun at the office Christmas party and still retain your dignity, and your job, is to have a plan in place before you head out to have fun. With a little preparation and planning, you can have a great time and be the life of the party without doing anything you would regret. If there will be alcohol served at the office Christmas party and you plan on enjoying a few cocktails, then eat before you head out to reduce the effects of the alcohol. If you eat a full meal with breads and meats, then you will have plenty in your stomach to absorb the alcohol you consume. When you are at the party, you should have a few appetizers before you drink to add to your food buffer. Avoid eating to the point where you feel stuffed, but eat enough to help you control the effects of drinking. No one knows your body better than you do, which means that you are only person who really knows your alcohol tolerance. When you arrive at the office Christmas party, ask the bartender to limit you to how ever many drinks you think you can handle. It is a smart move that could save you a lot of embarrassment later. The office Christmas party is a great opportunity for you to either change your image from an unapproachable person to someone that people find accessible, or to enhance the idea that you are a charming individual. Use the office Christmas party as your chance to make yourself someone that people want to work with and be around. If the office Christmas party is scheduled to start at 7:00 p.m., then plan on getting there around 8:00 p.m. It can be easier for you to get into having a good time at the office party if you arrive when the party is already in full swing. The temptation to strike up conversations about work at the office Christmas party can be strong because that is the one thing that you have in common with your co-workers. But people do not want to talk about work at a Christmas party, which means that you need to find other conversation topics to use when starting conversations with co-workers. There is usually a healthy amount of debate on whether or not you should bring your spouse to the office Christmas party. On the one hand, you may not want your spouse meet to the variety of people that you work with. On the other hand, your co-workers may feel a bit of a stronger social bond with you if they get to meet your spouse. That social bond can sometimes make the workplace a little easier. The best approach is to explain what your office atmosphere is like to your spouse and let them decide if they want to go or not. There is nothing wrong with you going to the office Christmas party on your own. But if you find out later that your spouse wanted to go and you never asked, then that could start its own flurry of problems. The office Christmas party should be a time when you and your co-workers get together to have some holiday fun. But as much fun as people want to have, you still need to maintain your sense of responsibility. Plan ahead and you can have fun at your office Christmas party without doing anything you will regret for the year to come. This entry was posted on Thursday, November 13th, 2014 at 6:46 pm	and is filed under Christmas, Office Etiquette, Office Relations, Office-code-of-conduct. You can follow any responses to this entry through the RSS 2.0 feed. You can leave a response, or trackback from your own site.